This week I finished reading Magonia by Maria Dahvana Headley. It’s a really fascinating and original read for me. The book is filled with colors, textures, feelings and sights that would encourage your imagination and insist that you try to view things from a different perspective. This story belongs to Aza Ray Boyle, a girl who is suffering from a mysterious lung disease that makes it ever harder for her to breathe, to speak — to live. It describes her perils on being a permanent fixture in hospitals, constant ambulance trips and emergency calls. She lives with a fairly average family, with over protective parents and a perfect and not to mention a healthy normal sister Eli. Her mother, an immunologist, has been trying to find ways to help Aza’s condition and looks likes she’s nowhere near into finding the cure. Her condition is so rare that it was named after her Azaray Syndrome. In the middle of trying to function normally and not think of dying every single minute, Aza shares a unique friendship with Jason Kerwin. Jason, who is just as nerdy (and awesome!) as Aza, is her best friend since they were five. Their shared love for facts and trivia, giant squids, rare bookstores and taxidermy dioramas forged a strong bond that now seems to be going towards an entirely different territory. Okay, before you even say that this another story about a girl dying and a boy who is madly in love with her and their journey to live their life to the fullest and discover the hard truths of life, I have to stop you there, this IS NOT that story. Not that I didn’t love that novel too, I’m also a big fan of that, it’s just that this book is not the same. Not even close. Aza’s adventure really starts when a few days before her sixteenth birthday, she saw a ship, not in the sea but in the sky and there she heard the sky calling into her. Here she started experiencing events close to being described as hallucinations brought in by countless drugs being pumped into her and the works of her vivid imagination. Birds talking singing to her, all species of off-season birds calling her name. Ropes dangling out of the sky and lightning and storms which only occurs in her block. In all these events she’s constantly looking for a logical explanation with the help of Jason, the almost-walking encyclopedia of factoids. It is only when he mentions of Magonia when it made a little bit of sense, all the things she’d seen and heard. And only until the day before her sixteenth birthday, she got all her proof of Magonia’s existence. Aza is awakened into a new world, a world of flying ships, singing talking sing-talking human-birds or hybrids of sorts, pirates, squall whales, storm sharks (yes they sound totally cool! ), the looming danger of The Breath and a vital role she plays in saving her kind and the world of Magonia. And for the first time in her life, she finds that she can breathe better, up there in the clouds. Headley’s writing is canny, sharp and funny. She was able to weave in the world of Magonia into her characters, who basically live for facts and logic. Their struggle, Jason and Aza, into understanding that what is happening to them is far from any scientific or logical explanation is what gets you glued to every page. Add the richness and complications of Aza’s and Jason’s characters, just two teens trying to express to each other that their friendship may have developed into something deeper adds more color to the story. I’m also amazed that Headley was able to write in beautiful supporting characters like Jason’s moms, Carol and Eve who I really really love and Aza’s ever supportive and unique Dad. She was able to build a strong fantasy world which is also consisted of characters like Dai and Caru. There are several parts though which made me feel a bit lost and at times confused especially with all the switches from singing to talking and to magically sing-talking certain things to life, like the control of the elements. I also think that there were many aspects of Maganwetar, Magonia’s capital which was left undiscovered. A possibility of a follow-up book perhaps? I know I wouldn’t oppose to that. I really love its ending. It was emotional and realistic. It didn’t just magically zap into a “happily ever after” where everything was right in the world again all of a sudden. Jason and Aza knew that something is different but they felt that it’s also right. 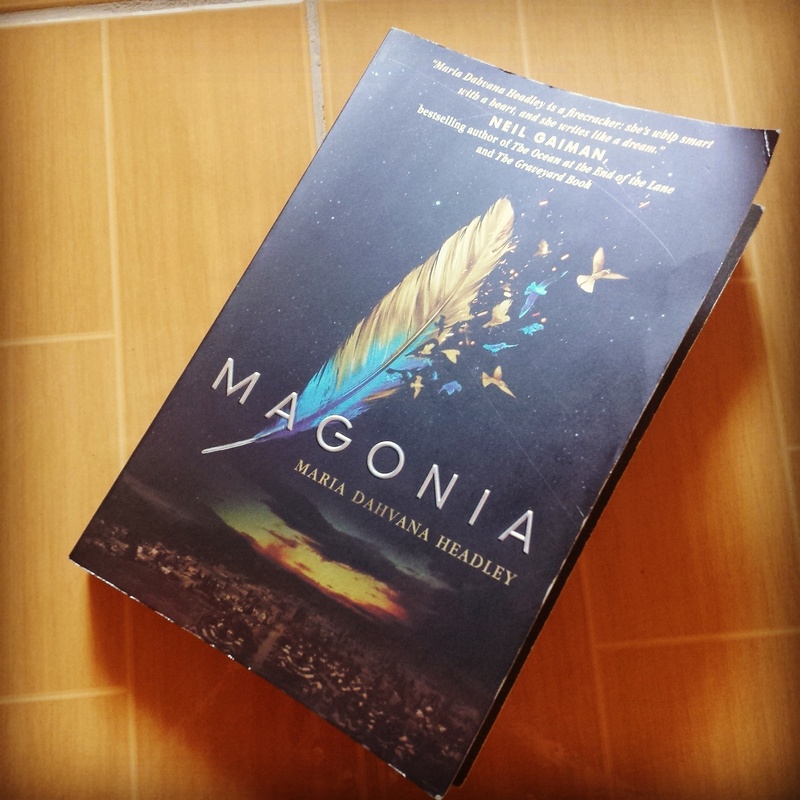 I would love to read more of Magonia and explore more of its world. I’m not sure if Maria Dahvana Headley is going to make a trilogy out of this, but one thing is for sure, I added another name to my authors to-follow-and-probably-stalk-and-fangirl-about list. Magonia seems like a really interesting story with an intriguing twist. Thanks for the review!